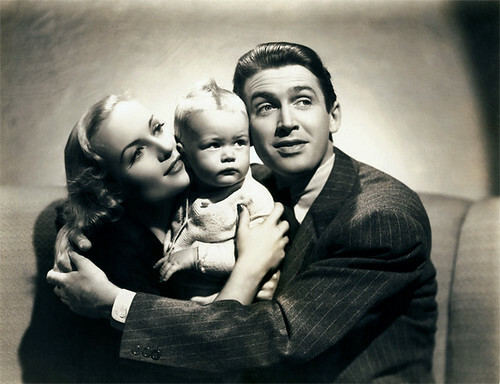 Carole Lombard and James Stewart struggle with bills, mothers-in-law, and babies in Made for Each Other. The Stars: James Stewart, Carole Lombard, Charles Coburn, and Lucile Watson. Source Material: An original story by Rose Franken. 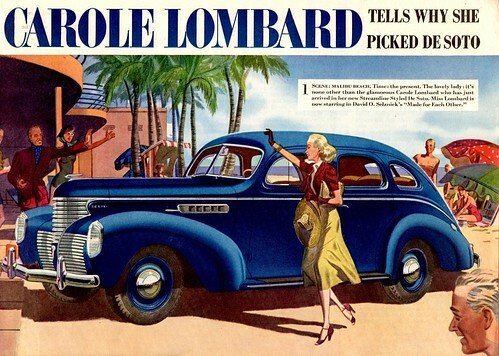 Carole Lombard endorses De Soto cars in an ad that was a tie-in for Made for Each Other. The Plot: Young lawyer John Mason (Stewart) meets Jane (Lombard) while on a business trip to Boston. They fall in love and get married, but their wedded bliss is tarnished by Mason's demanding boss (Coburn) and his domineering mother (Watson). 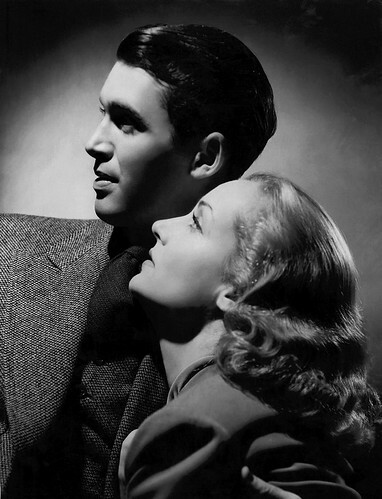 A beautiful portrait of James Stewart and Carole Lombard for Made for Each Other. Backstory: Carole Lombard was one of the most successful comediennes in old Hollywood, but by 1938 she wanted to move into dramatic roles. Lombard found the perfect role at Selznick studios, where legendary producer David O. Selznick had commissioned screenwriter Jo Swerling to write a script based on Rose Franken's original story. Selznick did not want an established leading man for the role of John Mason -- he wanted Made for Each Other to be a showcase for Lombard -- so he found James Stewart, then an up-and-coming supporting player at MGM. 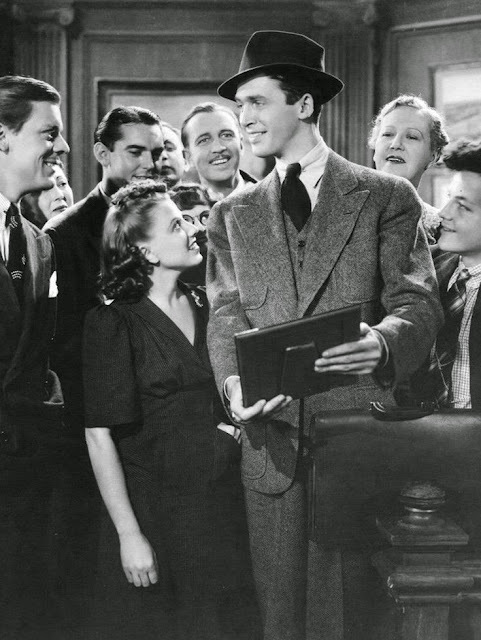 Bridegroom John Mason (James Stewart) is congratulated by the workers at his law firm in Made for Each Other. Best Performance: Carole Lombard as Jane Mason. At first, it is difficult to accept Lombard as an average housewife. She looks every inch the glamorous movie star with perfectly coiffed hair and immaculate couture, but she gradually grows into the role. Lombard wins over the audience by letting them see her frustration at the high-handed behavior of her mother-in-law, and her exasperation with her sometimes bumbling husband. Lombard is very touching in the scenes where her baby is desperately ill.
Best scene: John and Jane host a disastrous dinner party. Best Line: "Never let the seeds stop you from enjoying the watermelon," Lily (Louise Beavers), the Mason's cook, explaining to Jane that she needs to accept the ups and downs of married life. Flying Sequence: Director John Cromwell envisioned Made for Each Other as a low-key film about the realities of married life, but Selznick, always one for making movies on a grand scale, thought otherwise. 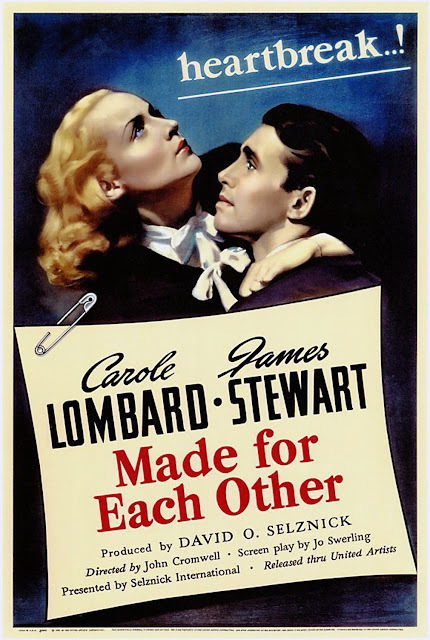 After seeing a preview of Made for Each Other, Selznick decided there needed to be more melodrama, so he inserted the sequence where a life-saving serum for the Mason's baby must be flown in from thousands of miles away. Selznick based these scenes on a real incident with his brother Myron, a powerful Hollywood agent. These were the days before antibiotics, and Myron was extremely ill with pneumonia until a special serum was flown into the hospital. James Stewart and Carole Lombard in Made for Each Other. Lombard's career: Although Lombard was one of the great comediennes of the 1930s, she desperately wanted to be taken seriously as a dramatic actress. Lombard's first foray into serious fare was Made for Each Other, which garnered great reviews from critics, but was a dud at the box office. Next, she paired up with Cromwell again to make In Name Only (1939), a drama co-starring Cary Grant about a woman in love with a married man. Lombard then played a self-sacrificing nurse in Vigil in the Night (1940) and a backstabbing waitress in They Knew What They Wanted (1940). None of these films lit up the box office, so Lombard returned to comedy in 1941 with Mr. and Mrs. Smith. Fun Fact: Stewart had to break down in tears for several scenes in Made for Each Other. He had a lot trouble crying, so, just before the scene began, he would hold a lit cigarette up to his eyes until they began to water. A vintage poster for Made for Each Other. Why it's essential: Made for Each Other is a realistic romance. Most films end at the wedding, but this is where Made for Each Other picks up, showing the audience the daily realities of married life. Made for Each Other deals with life of Depression-era America, but it's also relevant today. Anyone who's ever had a past due bill or interfering in-laws can relate to many of the situations in the film. Availability: Made for Each Other will be airing at 3:15 pm May 20, 2015, on TCM. It is also available for streaming on Amazon Prime and Hoopla Digital (a streaming service some public libraries offer). Made for Each Other is available on DVD and video on demand. The essentials will be off next week. Instead, we'll be participating in the Great Katharine Hepburn Blogathon with a feature on Summertime (1955).